PETALING JAYA: SP Setia Bhd has marked its first foray into China’s property market by inking a co-operation agreement with Hangzhou Ju Shen Construction Engineering Ltd in Beijing, the company said in a statement. 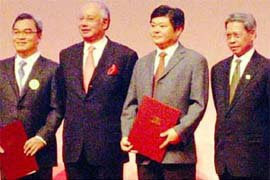 The event was witnessed by Prime Minister Datuk Seri Najib Razak yesterday, who is in China on an official visit. SP Setia president and chief executive officer Tan Sri Liew Kee Sin said the agreement would lead to the setting up of a joint-venture company to carry out a mixed property development project on a 25-acre site. The land is located in the growth corridor of XiaoShan, Hangzhou in the Zhejiang province. “The venture follows our first overseas foray into Vietnam in mid-2007 and is in line with our expansion to be an international property player,” Liew said in the statement. Property developer SP Setia Bhd has embarked on its maiden venture in China, teaming up with a local company for a mixed development in Hangzhou in Zhejiang province. In a statement yesterday, SP Setia said it will develop the 10ha site together with Hangzhou Ju Shen Construction Engineering Ltd. The joint-venture pact was sealed yesterday, witnessed by Prime Minister Datuk Seri Najib Razak, who is on an official visit to China. SP Setia president and chief executive officer Tan Sri Liew Kee Sin said that the project will be its third overseas, after the EcoLakes and EcoXanh developments in Vietnam. "This venture is in line with the group's expansion plans to be an international property player," he said in the statement. Liew added that it was still premature to disclose details of the joint venture, such as the shareholding structure and development cost. Hangzhou, about 180km southwest of Shanghai, is the capital of Zhejiang province and a key tourist and historic cultural city with a population of 6.78 million. PROPERTY development companies, SP Setia Bhd and DutaLand Bhd, both traded higher today following their announcement on joint development ventures in China. As at 10.35 am, SP Setia increased eight sen to RM4.18 while DutaLand rose five sen to 55 sen. Yesterday, SP Setia announced that it had entered into a co-operation agreement with Hangzhou Ju Shen Construction Engineering Ltd for a 25-acre mixed property development in the province of Zhejiang. The cooperation marks the start of the company's foray into China, and its third venture overseas after Vietnam, where it is developing the Eco-Lakes project at MyPhuoc Industrial. Meanwhile, DutaLand sealed a memorandum of understanding (MoU) with the China-Boda Group to jointly develop two pieces of land in Hebei province, as well as in the Iskandar Regional Development (IRD) Malaysia. DutaLand said the project in China would be developed over two phases.The the first would involve approximately 51.5 hectares and 100 hectares in the second phase. The company said phase one comprised a mixed development project with a total estimated gross development value (GDV) of RM3.1 billion. DOHA: Ezdan Real Estate Co, Qatar's largest developer by market value, said yesterday it planned to sell some of its real estate portfolio as it seeks to raise funds for billion-dollar projects in the next five years. Ezdan's deputy chief executive officer, Samer Wahbeh, said the company, which complies with Islamic law, would build schools, hotels, residential units and hospitals in Qatar, the world's biggest exporter of liquefied natural gas. "We are still quite bullish about the market and have an aggressive expansion plan and we need to fuel this growth for the company," Wahbeh said in an interview. To help finance new real estate projects, Wahbeh is in talks to sell about 4 per cent of its portfolio, worth about 600 million riyals, to a real estate investment trust based in Malaysia, Wahbeh said. He did not rule out pursuing real estate projects outside Qatar. KUALA LUMPUR: Plenitude Bhd unit Plenitude Permai Sdn Bhd (PPSB) has entered into a share sale agreement to acquire the entire equity interest in Intisari Sanjung (M) Sdn Bhd (Intisari) for RM24.5 million cash. In a statement June 5, Plenitude said Intisari was the registered proprietor and beneficial owner of 327 separate parcels of leasehold land situated in Mukim Dengkil, Daerah Sepang, Negeri Selangor. The land, Intisari's core asset, are adjacent to PPSB's existing ongoing mix development project at Taman Putra Prima, it said. The company said the proposed acquisition would provide the Plenitude group synergy in its property development activities where Intisari was expected to contribute positively to its revenue and profit in the future years. Plenitude executive chairman Chua Elsie said the proposed acquisition was in tandem with Plenitude's corporate vision of increasing land banks required for its property development business. "As often-mentioned, we are always on the lookout for a good piece of land. We seize the opportunity when we see one and our healthy balance sheet and cash flow position are able to support us in such prospects," she said. Chua said the land would be considered for future development of residential and commercial properties. "It will not only provide our group with a new sustainable source of income but it will also enhance our position in the property development sector," she said.